Announcement Thank you for shopping with me! Unless otherwise noted, items are made to order. Rush processing and rush shipping is available for an additional charge. Please contact me prior to ordering. I am committed to 100% customer satisfaction. If for any reason you are not completely satisfied with your purchase, please contact me. https://www.facebook.com/thecalisoboutique - Want to be the first to hear about new designs, giveaways, and sample sales?? Go like our page on Facebook for the scoop! Follow me on Instagram @calisoboutique - Do you have an instagram account? We do!! And we LOVE customer photos. Tag us using #calisoboutique for a sweet discount code! All items come from a smoke free, pet free studio. 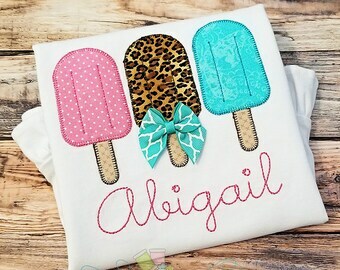 Finally listed this adorable birthday shirt. It's great for boys, and girls! 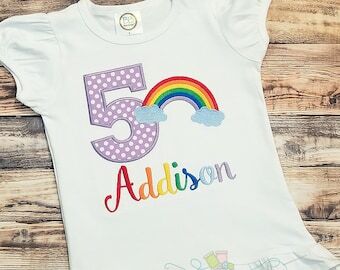 The oh so popular Caliso Boutique exclusive rainbow birthday shirt! Don't you need one for your upcoming party?